A let's not do very much at all weekend. Beautiful cards from Lesley, Helena, Jacky, Karen T and Mary-Lou. Thank you! AND way more than my fair share of extras too. Each one is different and special and will be cherished here, you can be sure. At the end of last week, as the postman handed over a brightly coloured clutch of cards, he asked what was going on. How to explain? I wasn't sure. ..
..but then I turned on my laptop. I should have known! 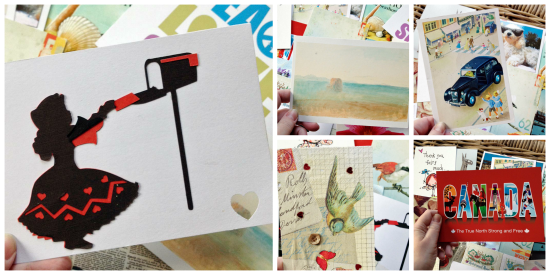 my Valentine's weekend was made all the sweeter by the posts about postcards, coming in from all over the world. You nailed it, postcard-ers! Or maybe mailed it? I want to thank every one of you for making it work. You are a thoroughly lovely, decent, reliable, do what you say you are going to do bunch. And that comes with love from me. Please do browse around the links on Saturday's post (27 and counting - about half of the postcard-ers so far). If you couldn't join in this time, it might persuade you to add your name -oh, in the summer, possibly? Finally, before I shut up about cards and get back to scrapbooking: if you didn't receive all of your cards, give it another couple of weeks and then, please, get in touch here. I'll make sure to put it right. You'll have six in the end. I guarantee it. So, Monday, Monday: it's Monday and time to wave at everyone who likes to start the week off with "hello". Last week Helena, Jane, Doris, Karen, Deb, Ladkyis, Rachel B, Fiona, Alison, Krafty Karen and Mel all joined in.Have a great week! Oops, I commented on last week's post and missed this one. Beautiful roses, such a gorgeous colour. I'm loving all my postcards as they arrive. I have loved receiving the postcards, thanks for organising the swap. I am joining you for Me on Monday this week. The swap has been lots of fun. Later this week, I hope to have the last two, and I get a photo taken! This weekend was the opposite of yours---incredibly busy and incredibly wonderful---more to come. I loved getting happy nail over the last week or so, thanks for organising. I'm waving from the depths of Toys r Us this week, it's been a while since I was last there! We had a really chilled out weekend and Monday too. I will defo join in in the summer as I kept putting it off and then missed it! 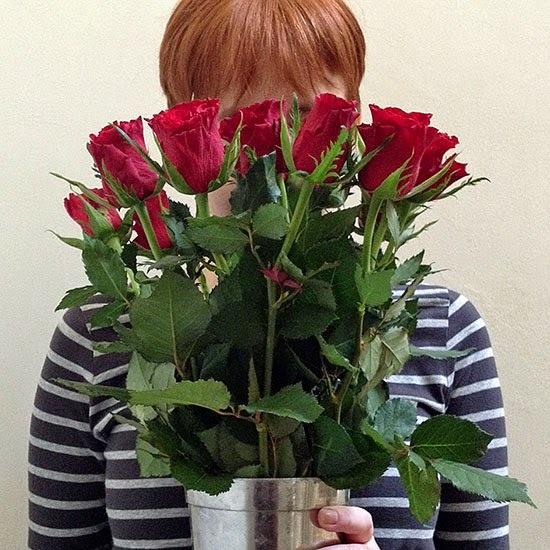 It has been lovely popping around the blogsphere and seeing what's arrived and where :). Great inspiration, Sian. I love the photo of you. I am reminded of Magritte :). I'm loving seeing all these postcards arrive and all the happy blog posts. I knew I would wish I had taken part. Lovely flowers...... Still waiting for mine to appear. Perhaps he will get them now they are reduced. It has been known! I have so enjoyed receiving and reading my cards. its good to have a weekend where you don't do much at all! The postcard posts are fab too! A day late but Mr P has come to the rescue and retrieved my photographs so finally can wave back at you!! Your 6th should be there any day, it was mailed last week. I plan on blogging about the ones I received once they have all arrived. Kicking myself for not taking pics of the ones I sent because they were so pretty (to me) :) Your roses are beautiful! Waving on Wednesday! Lovely, cheery post but I do hope all is well? wake up & smell the roses? The postcard swap was lovely again. I have mine hanging up on a magnetic rope right here beside me. I do hope all mine arrive at their destination although I fear not, they all had first class stamps on and were posted on the same day that I posted yours. Fingers crossed. Well I'd say your weekednd was just coming up roses. What a lovely bunch of flowers for a nice relaxing weekend. I've enjoyed seeing the postcard posts, too, as well as finding them in my mailbox! Not sure how I missed this post! Glad to see you got so many extras ... and nice to see mine peeping through! That's quite a nice collection of postcards!